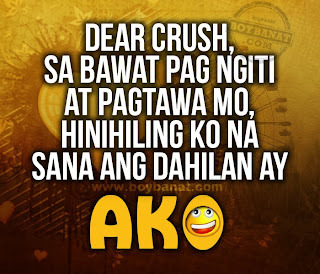 Dear Crush Love Quotes and Messages is a collection of cute tagalog quotes about crush that can ease the stone that had been sitting on your heart whenever you see or think of your crush. It's a little thing called crush on someone that makes you take a longer way to your classroom or even if it means going up an extra set of stairs just to see him. There are sleepless nights when you can't wait for the next day to come and have a glance with him. The person you get up every single day to see and the becomes the reason why you come to school. You even have that feeling of losing yourself inside whenever he passes by and smile at you. Somehow, all you want is just one chance. That's it. One chance to tell him how much you like him. Maybe it's time to express what you really feel. Here's our collection of Dear Crush Quotes and Messages that you can share with your crush or special someone. pwedeng ako naman i-ike mo? If you have your own favorite Dear Crush Quotes and Messages, we would love to hear it, simply add a comment below or just email to us with a subject: dear crush and will posted up for you. 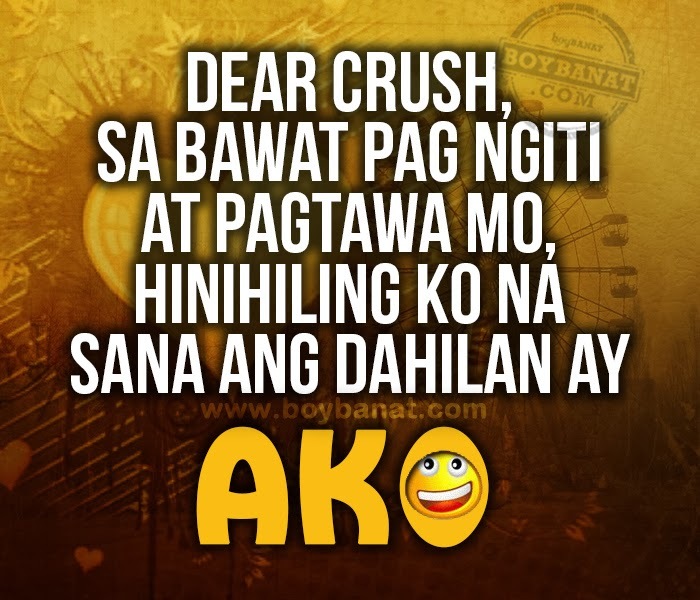 Dear crush...Sana ako na lang ang minahal mo kaysa sa iba!!! Dear crush...Sana ako nalang pansinin mo, wag yung taong pinipilit ilapit sayo.